Home Again: Friday's Favorite Five ~ March 19th! This week has been another celebration of life. Today is March 19th. Life has many turns, and I know I have shared this story before, but each year, it becomes a special milestone for our family. Thanks Susanne over at Living to Tell a Story, It's so fun to share our highlights. It was March 19th, 1971, that this young man, learned that life handed him a different deck of cards than expected. He lost a limb in a farming accident. .This stage was set which changed his life forever. He became grateful for a spared life. He had a tremendous support group of medical physicians, which gave him new hope. He was encouraged to think of the Olympics...he was on his way. Sports Magazine headlines...Calls came from all over Canada, supporting his new Olympic training schedule, off to Colorado...to train.........but what about wife and farm? But one day as we reflected more about life and our goals and values, he decided Family and Farming over Fame. As my children grew up, I always made it a point to recognize this day... It was an opportunity to share God's enduring promises to our family, regardless of the path! We both had the same framework, Our Faith in God! So this week I've been teaching those little grand boys about what it's like to be physically different. I found a children's book on the "Life of Rick Hansen." While I read it to Levi, he was playing....building...concentrating.. I said, "Would you like to see the pictures?" "No, Oma, I can keep playing.. I can visualize the pictures in my mind." I think his Opa read that book, three more times that night. Meanwhile,I taught the youngest, Silas to say, Go Canada Go! Well, as you can see, he mustered up quite a storm with his flags..shouting, "GOKANATAGO!" They sat quietly with their Opa, watching the stories of Rick Hansen and Terry Fox, unfold in front of them. I had taped the Paralympic Ceremonies. How much can they understand, you ask? I believe we have the opportunity to share life with these little ones as they learn to understand others, that live with physical disabilities. Oh by the way...they ate pizza and Lovella's rice krispie squares. Oh, they loved them! That's a first, in front of the TV! PICKING UP THE BOYS AND PULLING OFF THE EVENT! So what's the hype? I can never get my big kids together for a sporting event, like hockey, basketball etc., but when I mentioned the Paralympics?...they all wanted in! It's once in a lifetime. So we will all be going to watch the Men's Super G Alpine ~ Standing event at Whistler Creekside, this weekend. Those little ones are all prepared, with their Canada shirts, mittens, and flags. Today, my Best Friend ever, that Man of Mine, receives another Gold for Canada as a husband, father and Opa! He loves and values family. He gave up the FAME!!! Keep celebrating those milestones, my friends. PS...My little Levi, just called me tonight, to tell me that he is so excited to go to the Paralympics....he has never seen his Opa ski. Guess who's coming with me to Big White next year? I think I'm in for a great weekend! Marg, I loved this story and tribute to your husband . .the Opa to your grands. I know you will have a fantastic time together this weekend. It is just wonderful that you have kept the anniversary special for your children and now your grandsons. Blessings on you all this weekend. Such a great tribute to your man! And what a great reminder to teach your boys early about perseverance and what strength is really all about. Have a wonderful weekend! I love this post Marg! Your little ones have a great heritage and I'm glad that you share it and explain it to them. Have a great weekend! Great post, Marg...and tribute to someone who truly knows what matters most in this life! Wishing you and your family a wonderful time together at the Paralympic Games. 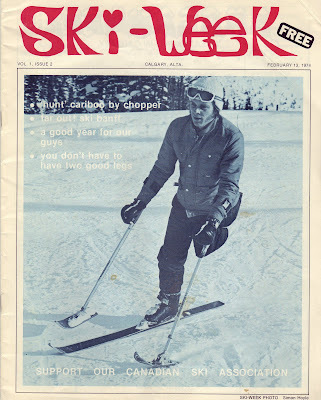 Oh...and I love the Ski Week cover photo! What a sweet post. I love how you put it together and the wonderful lessons you're teaching along the way. Blessings! Marg, when I read you were from Canada and your industry was sports I just knew you had kept a close tab on the Olympics. I read back to the post on the women's gold medal hockey game. What a game that was. We have a loose connection to the women's team (USA of course). My best friend's daughter played hockey with number 27 all her life growing up. In fact, my best friend's husband coached the little girls when they were young. We loved watching the game. Congratulations on a great win! And I heard about the paraolympics being held in Vancouver and I though how absolutely amazing it is that those brave athletes were going to be competing at the same venues and cheered on in the same town as the other Olympic games had been. That must be so exhilerating to them. Have fun this weekend! What great memories you are making with your grands. What an awesome story! What a gem your man is to choose family over fame! Hope you have a great time at the Paralympics! Oh, the lessons you are teaching your little ones ~ the importance of family, compassion, individuality, respect for all...important life lessons. Have a wonderful weekend being together with family ! Such an inspiring story of your husband, Marg! I had no idea he was training for the Olympics back then. Have a wonderful time at the ParaOlympics! Your husband is an inspiration! Hope you have a wonderful weekend at whistler. My boys just played a concert there for the Paralympics. They had a great time. have you seen this video of Rick Hanson? My heart was in my mouth - he sure isn't letting his disability hold him back in any way! You really have a unique opportunity in getting to see the paraolympics. I think I would enjoy that. Love the saying at the end. This was the neatest post -- and those grandkids look like SO much fun! How fun to spend time with your little grandsons and how nice to pay tribute to your husband. Life has good blessings for us, doesn't it? A wonderful FFF story. Thanks. Hi Marg! What a wonderful and loving family you have... Strong in Body, Mind and most importantly HEART & SOUL. It's beautiful that your grandchildren have a REAL LIFE testimony to all that love and strength! I love all your Olympic photos in the side bar! You're awesome! Your surprise to Judy was incredible to read! You go girl! Was this the first time you ever met Judy? What an amazing adventure! I'm soooooo impressed! God bless you, Marg~ this was such a fun visit! I never tire of hear ing this story . I think you are teaching your little ones that a 'handicap' is something pretty special!! I know you will have an amazing week-end!! I knew your husband was handsome; now I know he was "Cover Boy" handsome! Wowie! I hope you had the cover blown up and made into a poster for over your bed, and made him sign it too- "To my #1 fan!" Hurray for you coaching your grands to be Canadian flag wavers. I've been reading about how post Olympics the Canadian population has taken down their flags and National enthusiasm. I thought that was such a pity: there is so much about Canada to be proud of. Wave that Maple Leaf and sing out loud: Go Canada, GO! How blessed your family is to have each other. I hope the events were wonderful. What an inspiration your husband is Marg! This was such a wonderful tribute to him and your love for him.